Two leading Senate Democrats blasted the Obama administration for arm-twisting on TPP. A bill to give fast-track approval of the Trans-Pacific Partnership trade agreement cleared the Senate Finance Committee on Wednesday evening, and the legislation will hit Senate floor for a full vote in the coming days. It’s the biggest stage yet for a showdown between (most) congressional Democrats and the president they helped elect. Thursday morning, two Senate Democrats from the Finance Committee who voted against the fast-track bill called out the White House in strong terms for its hard sell on the corporate-friendly trade pact. The duo’s remarks obviously demonstrate the increasing intensity of the TPP debate. But they also illustrate how the fight over TPP is yet another vehicle for the even more serious debate within the party about being less beholden to corporate interests and more invested in populist economic policies. On MSNBC’s Rachel Maddow Show Tuesday night, Senator Elizabeth Warren said the deal had been negotiated by corporate lobbyists and that the process has been too secretive. “When the process is rigged, then the outcome is likely to be rigged,” she said. Brown offered dozens of amendments to the fast-track bill during the committee mark-up—88, to be exact—and will no doubt be a key player in the floor debates, where he will try again to attach some of those measures. He predicted he will have “well, well over half” of Democrats with him, though without some Republican votes that obviously won’t be enough. One key objection to the bill among both Senate and House Democrats: how weak the negotiating objectives are in the legislation. Fast track is a basic deal between Congress and Obama (or any future president negotiating a trade deal before fast track expires) where legislators lay out a series of objectives for the president to include in his negotiations, which he promises to abide by, and in exchange Congress agrees to fast-track the final trade deal: a vote has to happen within ninety days, cannot be amended, and only needs a simple majority in the Senate. But the strength of the president’s promise is seriously questionable in the legislation passed by the Senate Finance committee, which demands only that the president “makes progress in achieving” the various negotiating objectives. So the president—who negotiated the deal in the first place—just has to deem that progress was made, and that’s that. In the eyes of many Democrats, this language actually means the president is free to ignore whatever Congress has asked him to negotiate. Brown introduced an amendment that would strengthen these obligations, and it’s a major feature of the counter-proposal to fast track offered by House Ways & Means ranking member Sandy Levin. 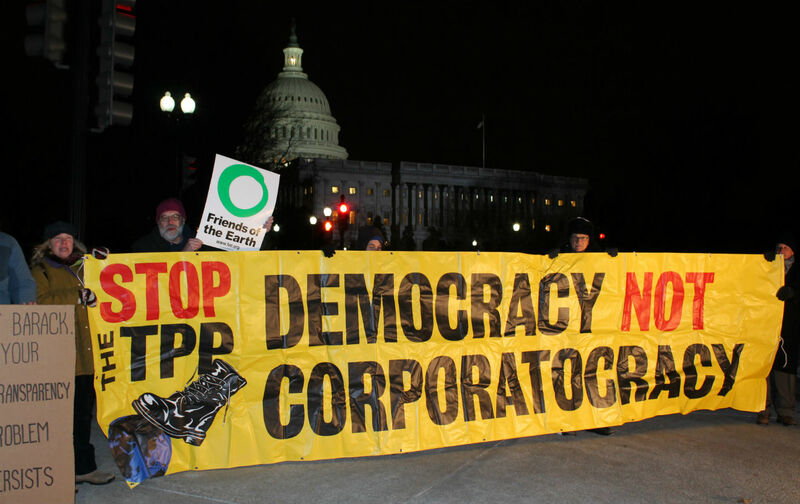 More than any issue, this could decide the fate of fast track and ultimately TPP: Congressional demands on labor, intellectual property, human rights and the highly sought-after currency manipulation prohibitions are meaningless if they can’t be enforced. The Senate Finance bill will hit the floor sometime after the body deals with the Iran nuclear deal legislation and other matters, and Democratic opponents are clearly ready to fight—even if it causes huge public inter-party rifts.